Madrid, October, 29th 1952; Is a noble ( Conde de Badarán) , architect and politician, currently president of the Senate of Spain. In 1987 he entered in to politics at the hands of Jose Maria Aznar, elected president of Castilla y León in the same year as CEO of Heritage and Cultural Promotion in the Castilla y León. In Madrid local politics has been director of Rehabilitation of the Old Town of the City of Madrid and 2nd Deputy Mayor of the City of Madrid. 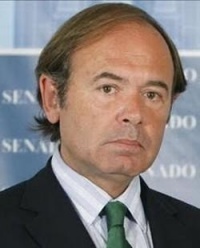 In 1991 he was elected deputy for the PP in Madrid Assembly, seat he held until 2003 and in 1993 became president of the Popular Party in Madrid, post he held until 2004. In December, 13th 2011 he was elected president of the Senate of Spain for the X Legislature. He has a degree in Architecture at the School of Architecture of Madrid. This page was last edited on 9 October 2014, at 14:30.